The LinkSprite pcDuino v3 Nano is an A20 development board with Arduino-compatible headers. A white, credit-card-sized PCB with an A20 chip. 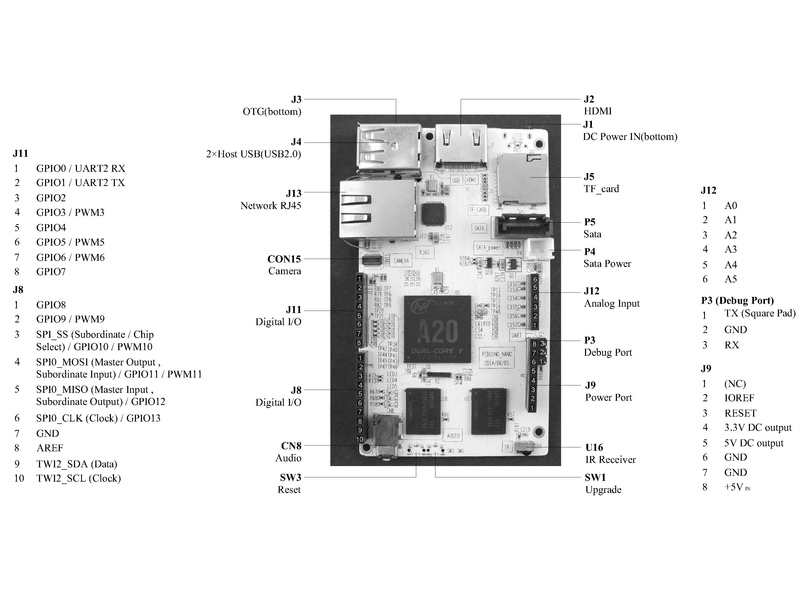 "PCDUINO_NANO" is marked on the board to the right of the A20. Fully supported by the upstream U-Boot and kernel, and the legacy kernel; it's not supported by the legacy U-Boot. Use the Linksprite_pcDuino3_Nano build target. Use the sun7i-a20-pcduino3-nano.dtb device-tree binary. The pcDuino3 Nano's SATA power connector uses a JST XH 2.5mm header, and is compatible with the Cubieboard. It's not compatible with the Banana Pi/Pro/M1+ and Orange Pi, where 5V and GND are inverted. The "UBOOT" button triggers FEL mode. The pcDuino3 Nano provides Arduino-style 0.1" connectors. The GPIOs operate at 3.3V rather than 5V. The analogue input pins on a real Arduino can also be configured as GPIOs; here they can only be inputs. The larger-than-standard PCB size and the position of the UART0 connector means some shields won't physically fit. The pcDuino3 Nano provides access to four (and a half) of the A20's UARTs. See the UART howto for more details. The 3-pin header labelled "UART" sticking out from the side of the board is the A20's UART0. Pin 1 (with a square pad, closest to the IR receiver) is RX, pin 2 is ground, pin 3 is TX. UART2, UART5 and UART6 (RX/TX), as well as UART4 (RX only) are available on the Arduino connectors. UART2 is in the standard place for an Arduino UART. Note that the labelling in LinkSprite's diagram is a bit confusing -- UART2 is described from the A20's point of view but UART0 from the serial cable's point of view, i.e. RX and TX are reversed for UART0. The pcDuino3 Nano Lite is a version with no flash memory (NAND) and without IR receiver. This device has not been rebadged. The Ubuntu 14 image that LinkSprite provides uses a modified linux-sunxi 3.4 kernel. Their patches and build scripts are available on GitHub. The most important modification is in the GMAC driver, to set the GMAC_TX_DELAY parameter to 3. This adjusts the relative timing of the clock and data signals to the PHY in order to compensate for differing trace lengths on the PCB (details; the Banana Pi has the same problem). Without this modification, the Ethernet port will work at 100Mbit but not at 1000Mbit. Upstream U-Boot now sets this parameter itself, so the kernel patch isn't needed any more (patch). In the meantime Armbian also supports the pcDuino3 Nano with Debian Wheezy, Jessie or Ubuntu Trusty and with both kernel 3.4.x and 4.1.x (including SoC temp fixes). This page was last modified on 8 December 2018, at 04:43. This page has been accessed 23,557 times.